Click here to see Onions, Brassicas and Leafy Greens, or use the drop-down menu. This is a local Quebec heirloom that produces delicious fruit with dark green skin and crisp white flesh. The auntie is very productive even in our recent cool wet summers. Produces lots of medium-sized crisp and tasty fruit. Compact vines climb easily. Perfect for containers. These little marvels (about the diameter of a penny) have to be seen to be believed. I call them Barbie doll watermelons. The small oval fruit have a powerful, sweet, cucumber flavor with a tangy, citrus twist. The plants grow beautifully, climbing up a trellis and filling it with their delicate leaves, flowers and fruit. Or try them in a hanging basket. An unbelievably reliable and early producer of glossy purple-black fruit even in cooler conditions. Not the least bitter. 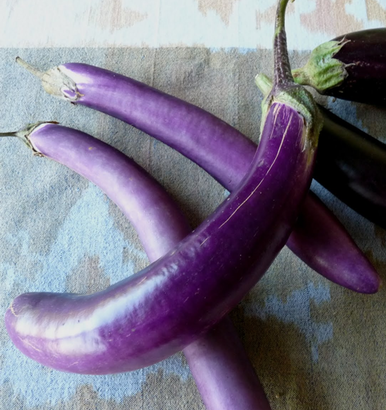 A sweet, tasty, beautiful eggplant that is an easy grower even in our climate. 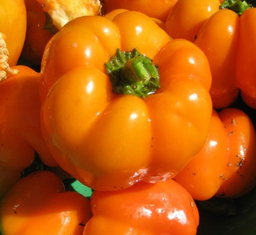 An American family heirloom that produces beautiful orange, smallish sweet peppers from high yielding, disease resistant plants. Grows well in a container. A real winner. 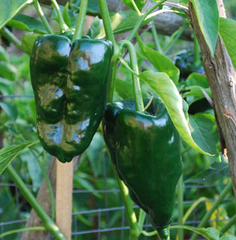 An easy to grow variety that pumps out dozens of pointed pale yellow peppers. 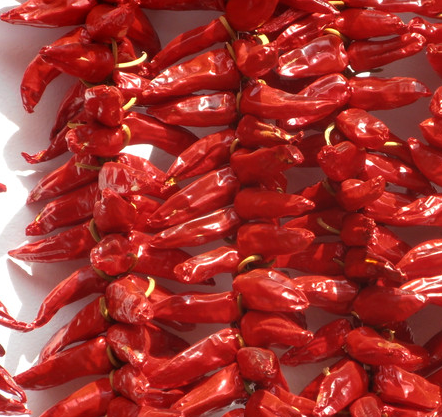 Leave them on the plant to turn red and then dry them for a delicious paprika. They also grow well in a container. This long, thin-walled, frying pepper from Italy is listed on the Slow Foods Ark of Taste. It produces good yields of pointed fruit that ripens to red. The mild flavour gets sweeter when fried. The perfect pepper to grow in containers. 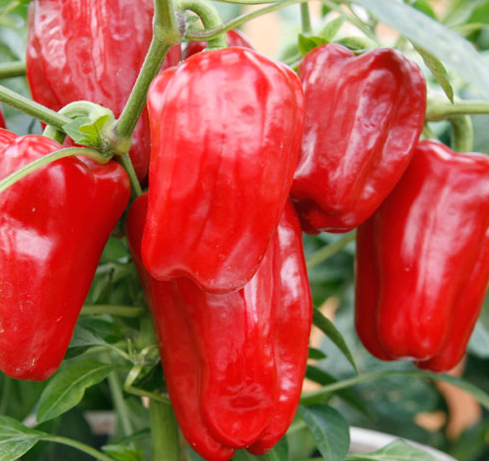 The compact plants load up with sweet red peppers and produce fruit very early. Also great for small gardens. Square green fruit turn purple as they mature. The peppers stay nice and crunchy and are so pretty as well as yummy eaten fresh off the vine. Other varieties will be available from the greenhouse. 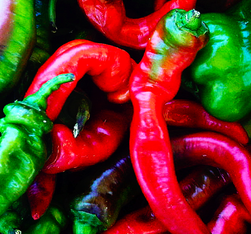 A mild, heart shaped pepper that is perfect for stuffing and making chile rellenos. The dried ancho pepper is used to spice up many different dishes and they are quite productive even in our less than perfect conditions. I love this pepper. Both the plant and the fruit are gorgeous. 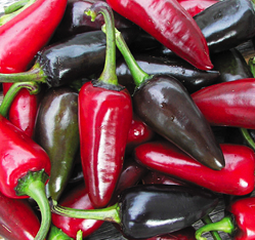 The flowers are purple, the green foliage has a purple tinge and the peppers themselves are a shiny deep purple. Not super hot but very rich in flavour. Easy to grow. Perhaps the most famous and sought after pepper in the world! The true Espellette is grown only in the Basque region of France but I offer this version for our tables. 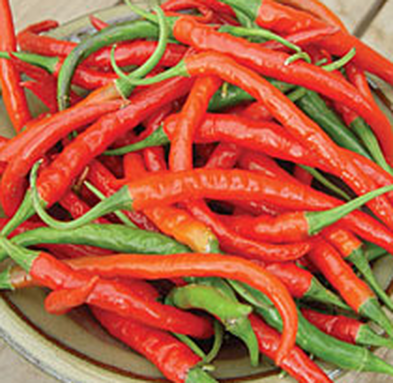 It has a wonderfully complex flavour, with a rich, slightly toasty taste and moderate heat. It is generally dried and ground but can also be used fresh. Five to six inch narrow fruit ripens to deep red. Dries easily and stays useful in the kitchen for a long period. Prolific and just nicely hot. Ornamental strain with variegated foliage, purple flowers and multicolored peppers. They are very, very hot! Good for containers or flower beds. 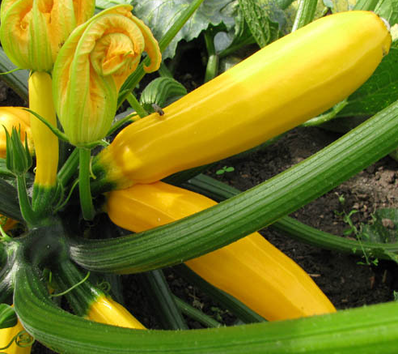 This delicious Italian heirloom produces lots of male flowers for those who love to eat zucchini blossoms. A big sprawling plant, the fruit has a distinctive gray-green skin with prominent ribbing. Slender bright golden-yellow fruits grow on a smaller bush plant. Not as crazy productive as other varieties which for a zucchini could be considered a good thing. 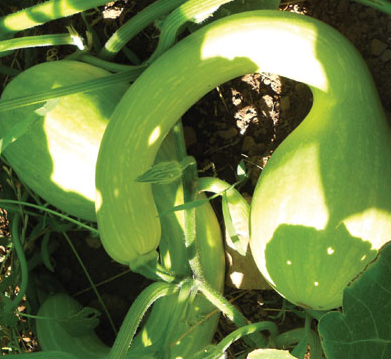 Round zucchinis from the south of France are a lovely pale green with white speckling. Best eaten small. Very nice stuffed. Rampant climbing vines produce a long fruit with a bulbous blossom end. I love growing these beauties around my garden gate because they look so beautiful hanging there. 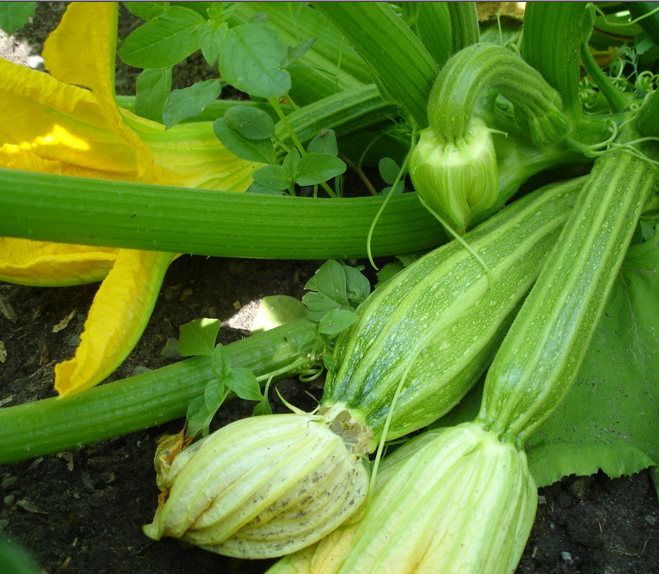 And they are so delicious that many believe them to be the tastiest zucchini of them all. 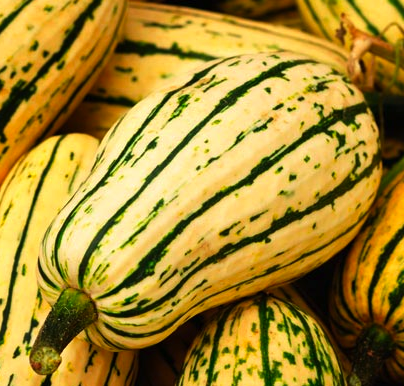 A lovely small oblong squash, ivory-colored with dark green stripes. Super sweet and their modest size, about a pound, makes them perfect for dinner for two. Another modest sized, sweet tasting squash. 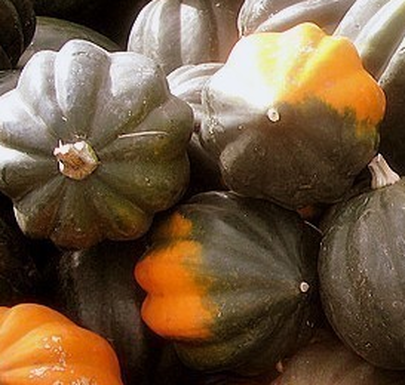 An excellent squash for baking and the plants don’t require a huge amount of space. Lost and then found again, this beautiful historic Quebec melon has a delicious nutmeg-like taste. A beautiful and rare heirloom from France. The skin turns from black to yellow as it ripens. Very easy to grow. Sweet and juicy. Early maturity, sweet flesh, exceptional flavour and aroma, produces heavy yields of 4-5 pound melons. Another French heirloom. Strangely ugly and warty but soooo good. Canadian heirloom bred around 1912 by Father Athanase of the Trappist Monastery at Oka. Creamy yellow ribbed skin with sweet orange flesh. Plants are loaded with small (1 lb.) yummy melons. Beautiful dark green skin dappled with a galaxy of yellow spots. This sweet juicy watermelon is easy to grow. An outstanding little watermelon with golden yellow rind and salmon pink flesh. Pleasantly sweet, about 3 pounds in weight.